This is NOT my current situation, but wanted to do this for sometime, to simply use an image to get people to think. Approx 49% of marriages in the US end in divorce. Absolutely staggering and to think the effect that has on children. It has always amazed me how 2 people who are so madly in love can in some cases turn into 2 people who cannot stand the sight or company of that same person down the road. I am no expert and don’t want lecture anyone about staying in abusive relationships or such, but really the work needs to be done at a younger age. Why do schools not give children the tools at younger ages and teach them subjects about integrity, respect, love, caring, values and how to manage finances? Surely fitting 30 mins to 1 hour a day into a school curriculum can’t be too much to ask and not just left with parents. These are tools that our youngsters should be equipped with at home and at school. Critical tools that all kids should have an abundance of. Respect, love, generosity, kindness, patience, caring, free of ego and the need to be right. Maybe one day? Thankfully, my son attends a school where respect, trust and compassion are important parts of the curriculum and are practiced from Kindergarten on. I’m fortunate to have the opportunity to educate him in this way, and I hope that this foundation serves him well in the future. Now, adding the subject of finances is a great suggestion! Hello there, I’ve nominated you for the Versatile Blogger Award cos I really enjoy your blog. Have a look at my post for details…. I basically took this book (sacrificed the poor thing – nothing worse than burning books – but I thought it would be good sacrifice to add meaning to a photograph), got a whole lot of paper and a fire starter. Before I lit the fire, I took a couple of sample shots – to make sure frame was filled. I then lit the fire starter and it spread to the paper. I had to do it twice and paper burn so quickly (I needed the flames for effect) and smoke was coming up into my face. So I had to move very quickly. So I had the image perfect after those 2 bursts and had the image with the flames engulfing the book (I also had to tear the book down it’s spine 3 times to make it thin enough to burn). Then all I did was crop it and add a HDR type layer. And that really just hardened the font of the book. Everything else was there. I added a vignette effect and frame and name as text. So simple – as long as you plan. Try it. Oh and this whole scene was in my fire pit…..
Kenneth, thank you for engaging in a subject that is near to my heart. 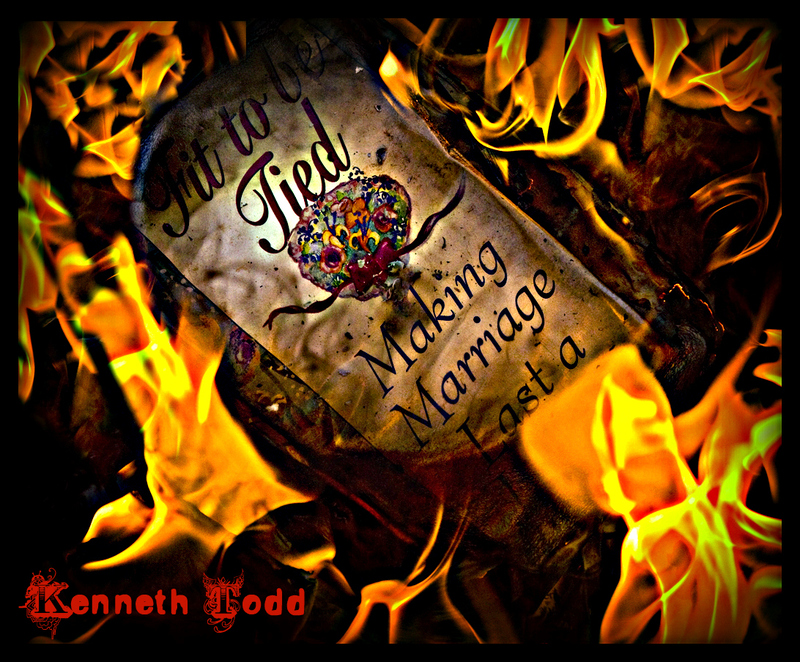 I am concerned for the state of marriage, especially the marriages of those people in my sphere of influence. I have taken to asking my friends, “What are you doing to improve your marriage?” knowing that all marriages need work, and wanting a non-threatening question that would make people think and act constructively. However, I’m going to disagree with you about adding the subjects you mention to the school curriculum – not because I think these subjects are unimportant, but because I think they are SO important that I wouldn’t want someone else teaching them to my children. Please leave this job with the parents! Many of these concepts – e.g. integrity, love, values – are more “caught” than taught and therefore are present already in the schools. I believe that schools should insist on mutual respect and concentrate on teaching academic subjects. Maybe the place for these subjects is in parenting classes? I also think that pre-marital counseling has a valuable part to play. So, I agree with you that our children need these critical skills, but disagree on how they should get them. Ruth thanks for your comments. You touched on important points of my post – thanks for that. Human ego (and here I am not referring to vanity or look at me etc) and the need to be right. So our opinions or views that we KNOW the RIGHT way and THEY don’t, is exactly that (don’t get me wrong, not pointing fingers at you here) that is so ingrained in our society and is in all relationships – parenting, working, loving, friends etc etc. Once we let go of that view collectively (all of us), then all of a sudden relationships work better, less friction, less conflict. Think of this, if one believes that they are more capable than teachers (who are also parents) to assist in teaching their kids about love, respect, integrity etc that is OK. But what happens when that persons own kids grow up (with integrity, love and respect) and become teachers? Does that make them more capable then to teach kids, because they are products of that persons teachings or should that teacher still hold back from teaching / sharing those values, because they are “her / his” own values and should not be shared or taught to others? Mine vs Yours? That is the paradox and what Eckhart Tolle so brilliantly presents as ego consciousness, that is all around us everyday. Thanks again for visiting, comments and dialogue. I am glad this post opened up a discussion and we get to see everyone’s different point of views. Ruth, I don’t understand why you say “all marriages need work.” What kind of work? My husband and I have been happily married for 16 years and don’t feel we have to work at it. I checked with my mom who has been married for 47 years to see if she’d agree marriage requires work and she said no too. Is cooperating to care for our children and our house work? I think it’s just part of life. When we turn anything into work it becomes less enjoyable. But to the point, I agree with you that relationships are not something to be taught in schools. How artificial to make a curriculum out of things like respect and love! Children are respectful when they are respected and loving when they have been loved. (Finances, however, is a more concrete topic I believe would be a good addition to the offerings in school.) Of course, I am a homeschooling mom and think schools do a poor job in a lot of ways. But the best they can do is be more loving and respectful to model that for the students. Loving the photo, and the conversation trail here. I agree with you Ruth. The person/people who should be teaching my children these values is me and my husband. No other person has exactly the same values as me, and knows what that looks like. therein lies the difficulty – we are all faulty in some way, so our areas of lack will be found in our children. This is the way of things, but it doesn’t have to stay like that. It takes work, effort, help from others, and a lot of commitment. This is where the rubber hits the road as I say. Thank you for the opportunity to join in this valuable conversation. Hi Catherine, For this shot, everything was natural. Only used Picnik to create HDR effect and add my signature. That was just to sharpen up the text on the book. I try to plan the shot as much as possible so don’t have to do any editing. When I use editing software, Photoshop CS3, Picnik, For iphone, HDR PRO, Snapseed, PicGrunger. I think it would be amazing if everyone was required to read Dale Carnegie’s book How to Win Friends and Influence People. It is way more than a book for sales people to read and utilize. It is a hallmark of human understanding. I have especially taken to heart the chapter entitled: “If You Want to Gather Honey, Don’t Kick Over the Beehive”. Interestingly enough, it is found in Part One, Chapter One of the book. It deals with criticism. A fundamental way to any human’s heart is to learn how to not criticize. Even when we have a bone to pick with the other person, learning how to state our grievance without stomping all over the other person’s feelings and ego is well-worth learning how to. The reason, I believe for so many divorces is that people just start criticizing each other to the point where all they can do is be mean to one another. They forget how to say loving, caring things. And that is how the love becomes hate. Words and attitudes change it. If we are conditioned properly very early in life (and for the most of our life “time,”) how to create, start, sustain, and develop positive relationships, I think we will have lesser disputes today.